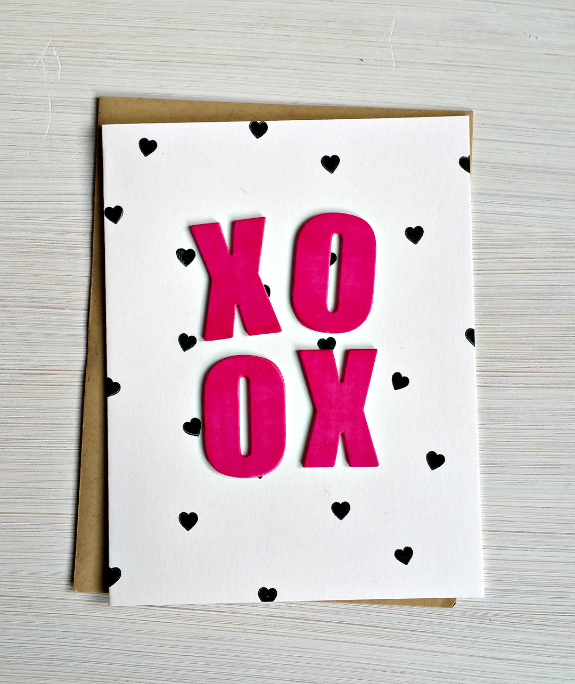 Here's a quick, fun, card that can be used for Valentine's Day or anytime you want to send a hug. The background was a snap to make. Found a small heart in Concord & 9th's Beautiful Words and stamped it around an A2 card. I'm betting you have a similar heart somewhere in your stash! You can use a circle stencil to help place the hearts. I used one from Stampin Up. Colored some pale pink paper with a neon pink Copic marker and die cut Xs and Os 16 times using Altenew's Bold Alphabet Die. This is a pricey set of dies so it took me a while before I finally decided to purchase. I plan to use them a lot. If you don't want to spend that much, using a Silhouette or Cricut would also work. Stacked 4 of each die and adhered in a wonky way. MOOD WHEN DONE = All hugs and kisses here. I looked and it's pricey, alright, but makes a fabulous bold statement on your card. Love the neon pink. I need to do something simple for Valentine's this year. Can't seem to get with it. This is super-cute! Just right for a teen or even a husband! How tall are those letters?